Zierikzee (in Zeeuws Zurrikzeê) is a city in the municipality of Schouwen-Duiveland in the Dutch province of Zeeland. With about 1100 inhabitants, the city is the main town and largest city. Zierikzee has been a protected cityscape, one of the protected city and townscapes in Zeeland, since 1971, and is known as a monument city. 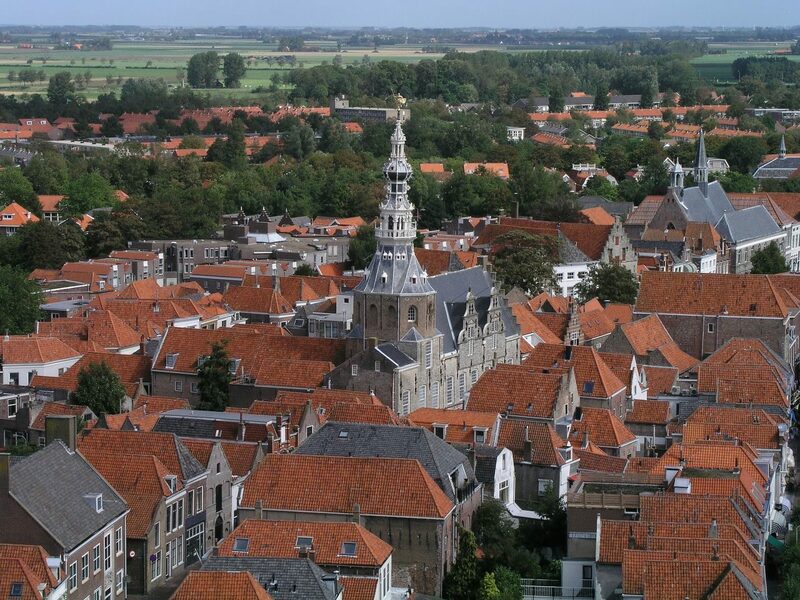 For a relatively small city, Zierikzee has a large number of monuments, namely 569. In addition, there are 379 municipal monuments in Zierikzee. The St. Lievensmonstertoren, is the most eye-catching monument, with its 62 meters it is the tallest tower in the city. The tower is commonly referred to as the Thick Tower. This tower looks like two drops of water on the St Romboutstoren in Mechelen. Furthermore, the Mill De Hoop, Mill Den Haas, New Church, Zierikzee Town Hall and the Templars Home are worth visiting. In Zierikzee there was a city wall. The current Nobelpoort, Noordhavenpoort and Zuidhavenpoort are the only remaining city ports of Zierikzee, the Westpoort, Zuidwellepoort and the Main Gate were demolished in the 19th century. What is now understood under the Slingerbos was the actual foundation of the city wall, the canals of the city wall are still spared. However, there are still remains of the city wall. The municipality of Schouwen-Duiveland is extensively busy expanding and modernizing Zierikzee, so that residential areas are being renovated within the canals, and residential areas are being built outside the canals, and the center is being renewed. In October 2015, two LED information boards are located at Zierikzee's access roads. Furthermore, the municipality of Schouwen-Duiveland plans to move the large retail chains into one central spot outside the canals, and they are also planning to expand the marina to increase the number of tourists visiting the city.